NYC progressive death metal squad Hung bring an experimental twist to the heavier end of the metal spectrum that instantly grabs your attention on their five-track collection, Progeny." With an evil vocal rasp leading the charge, the key ingredient which sets Hung apart is the frantic and foreboding violin (yes you read that right) of Lyris Hung, often played with nuances of lead guitar in mind, creating a pristine yet haunting sound that truly radiates something unique. It doesn't hurt that the rest of the group consistently showcases dexterous musical proficiency at every step (especially with the bass) while churning out weighty pieces of music shrouded in demonic bliss and brazen with technical ecstasy such as "Maria." This quintet juxtaposes black metal's iconic intolerance and progressive metal's mesmerizing musicianship into grandiose compositions laden in hellfire to create the closest thing NYC has ever come to their own version of pagan metal. If you dig the true metal underground at its most expansive, Hung will not disappoint. 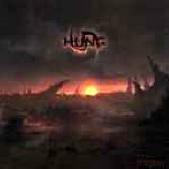 Hung: Vocals: Dmitry Kostitsyn; Guitars: Evil Jon; Bass: Sam Roon; Drums: Mark Nettleingham; Electric violin: Lyris Hung. For more information, check out http://www.hungrocks.com.